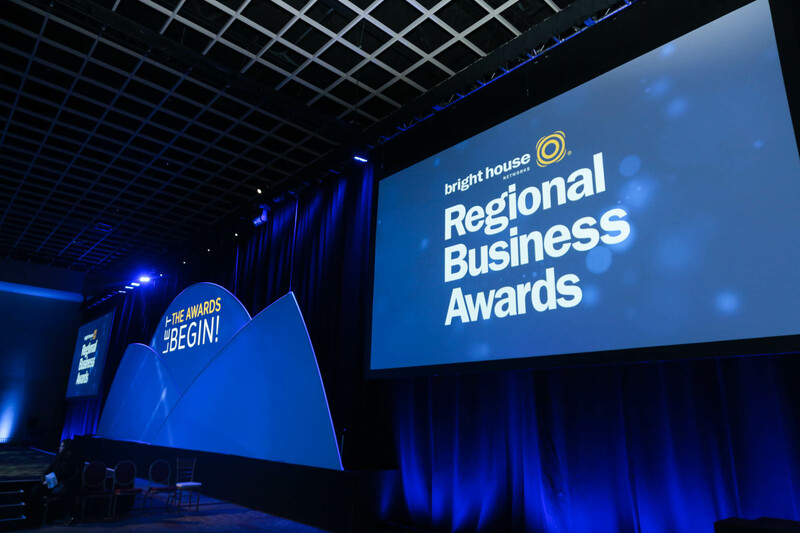 Orlando, Fla. (March 19, 2015) –Bright House Networks announced today the winners in its first annual Regional Business Awards in the Greater Orlando Area. Winning organizations were named in each category: Small; Medium; Large; and Start-Up for the awards, which honor the companies, organizations and people whose products, services, and thought leadership have impacted the local community. Winning businesses were honored at a special celebration on March 19 at Rosen Shingle Creek. Guest speakers for the event included Florida Governor Rick Scott and 2014 NFL Football Hall of Famer Derrick Brooks. The Orlando Economic Development Commission also recognized Deloitte Consulting with the 2015 Newcomer Award, which honors the newest neighbor in the Greater Orlando regional business community. Bright House Networks teamed up with Chambers of Commerce in nine counties to host the event that connected local businesses in a celebration of best-in-class. The company awarded prizes totaling over $1,000,000, including commercial TV production, air time, customer newsletter, and cash. More information is available online at www.brighthouse.com/RBA. Bright House Networks serves approximately 2.5 million customers who subscribe to one or more of its video, high-speed data, home security and automation and voice services. The company also offers a strong portfolio of customizable, advanced business solutions for video, voice, data, cloud-based and managed services. The company is MEF-certified and also recently received the Cisco® Master Service Provider Certification under the Cisco Cloud and Managed Service Program, the first cable operator in the United States to achieve this designation. Bright House Networks also owns and operates exclusive, award-winning, local news and sports channels in its Florida markets. For more information: brighthouse.com. Follow the conversation at #BrightHouseRBA. Let’s connect: House2House, @BrightHouseNow, Facebook and LinkedIn.